I met Roger Moore this past Spring at the Ballet Ball; seated next to him at dinner, I couldn’t have asked for a finer evening! Roger is an absolutely enchanting conversationalist. That night, I learned that he is a professor of English literature at Vanderbilt, specializing in early modern English literature and religion. Since then, I’ve learned that he is also Associate Dean for Undergraduate Education in the College of Arts and Science. Roger was apparently destined for academia, pointed strongly that direction by his wise parents: “They recognized early on that I was completely impractical and unworldly, and they rightly realized I would thrive best in the cloistered environment of a university.” His parents also taught him to write thank-you notes, which he has found to be a good and important life skill. Well done, Roger’s parents! When Roger isn’t teaching and writing, he loves to travel. Next on his list is the Champagne region of France, followed by a Rhine River cruise. He’d also like to visit East Anglia in England, where he’d see Norwich’s medieval churches and stately homes like Houghton and Holkham. Be aware if you travel with Roger that he does have a habit (considered slightly annoying by some) of mimicking sounds he hears – birds chirping, the tweeting noise of “Don’t Walk” signs, the beeping of a construction vehicle in reverse – usually unconsciously. Some might say this only enhances your travels! Certainly it might keep you safer. I’ve been privileged to travel to England a couple of times a year recently to conduct research for a book on Jane Austen. 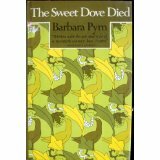 Before each trip, I’ve developed a ritual: I select a novel by Barbara Pym (1913-1980) to read on the plane. I spend a good deal of time considering which well-worn volume I want to take off the shelf. Will it be Some Tame Gazelle (1950), Pym’s first published novel and a delightful take on stifled romance in an English village? Will it be The Sweet Dove Died (1978), a frightening portrait of a vain woman’s attachment to a younger man? Will it be Quartet in Autumn (1977), a study of four office workers on the brink of retirement? On and on I go down the shelf, pondering the merits of each of her novels and considering which one will bring the most pleasure on my transatlantic journey. There are so many possibilities! But what is it about Pym’s novels that makes them especially appropriate preparation for a trip to England? After all, I could just as easily select books from any number of other English writers to get me in the mood for my visit. I turn to them in large part because they offer a window into a certain type of cozy Englishness that is particularly appealing and comforting, and which has in many ways been lost forever. Much like Jane Austen, to whom she is often compared and who famously declared that “three or four families” in a village was “the very thing” for a novel, Pym finds rich material in the circumscribed lives of characters in English villages, or in neighborhoods of London that seem like small villages. A fervent Anglo-Catholic, Pym eloquently describes life in a small parish. She writes of spinsters who channel their frustrated romantic lives into selfless devotion to local vicars, of dust-ups over the proper decoration of a church in Eastertide, of the politics of the local parochial church council. Her characters are middle-class, many just barely retaining a hint of gentility and sliding into the category of what Pym calls “distressed gentlewomen.” They live in undistinguished villages or in unfashionable areas of London – “West Kensington” or “North Hampstead,” neighborhoods that lie “just outside the Harrod’s delivery area.” These characters prepare their meagre, often tasteless dinners on “gas rings”; they spend a great deal of time “washing up the tea things.” The conflicts at the heart of her novels, while deeply felt, are not earth-shattering. Her characters endure hardships and disappointments, but they are never defeated; they are upbeat and find solace in doing the best they can. The novels evoke a time when the church was still at the heart of English culture and when the English were bound by a common literary and cultural tradition. I cherish them because they gratify my own nostalgia for lost worlds. This is not to say that Pym was unaware of the disappearance of the world that she chronicles. She notices the slow but steady transformation of English culture in every novel. The churches that are so important to many of her characters are usually empty, reflecting the abandonment of organized Christianity in England during her lifetime; her clergymen must compete with television, the new object of devotion, when they make their parochial visits. Old patterns of living have similarly disappeared. Wilmet, the protagonist of A Glass of Blessings (1958), notices these changes when visiting a friend living in a once-fashionable neighborhood. The stately homes lining the squares are now tatty and seedy; dwellings that once housed single families are now divided into numerous tiny flats. Pym notices the post-World War II changes in population as well. In Quartet in Autumn (1977), the prim Letty feels uncomfortable when Mr. Olatunde, a Nigerian Christian, buys the house where she lives from the previous owner, an elderly English widow. Her new neighbors are given to enthusiastic, noisy worship services. When she asks them if they could be “less disturbing,” Mr. Olatunde replies “Christianity is disturbing.” Letty does not know how to reply. The activities of their department seemed to be shrouded in mystery—something to do with records or filing, it was thought, nobody knew for certain, but it was evidently ‘women’s work,’ the kind of thing that could easily be replaced by a computer. The most significant thing about it was that nobody was replacing them, indeed the whole department was being phased out and only being kept on until the men working in it reached retirement age. Edwin occasionally passed the end of the road where she lived and had more than once thought of calling on her unexpectedly. But something, he wasn’t sure what, had always held him back. The parable of the Good Samaritan kept coming into his mind and making him feel uncomfortable, though it wasn’t in the least appropriate. There was no question of him ‘passing by on the other side’ when he didn’t go anywhere near the house, and for all they knew, Marcia was perfectly happy. Of course Edwin did not know that she was, but for some obscure reason he felt that if anyone was to blame for not having kept in touch, it was Norman. It is not surprising that Pym looks so unflinchingly at retirement and mortality when we consider that this novel was published in 1977, when she was 65 years of age. She had endured a bout with cancer earlier in that decade, and she too had recently retired from her position as an editor of a scholarly journal. The novel was also written near the end of an almost twenty-year period of relative obscurity; Pym had been unable to garner a publishing contract since the early 1960s and was deeply disillusioned by her inability to continue publishing. I agree with A. N. Wilson that Quartet in Autumn is Pym’s “bitterest novel,” but, unlike him, I do not see anger as a prominent feature of her work. Even in this dark tale, Pym sees beauty and kindness; she manages to suggest that good comes out of evil and that it is possible to forge meaningful connections with other people. As in so many of the earlier, cozier novels, Pym here expresses her faith in the ability of individuals to persevere, to do one’s best, even in the most trying of circumstances. The novel is also brilliantly funny; Pym has a gift for portraying the comedy of human selfishness and vanity. Quartet contains a darkly hilarious description of Letty and Marcia’s retirement party that is one of my favorite scenes in any novel. The work was popular and was responsible for generating interest in Pym after years of obscurity; it was shortlisted for the Booker Prize in 1977. Pym’s writing career resumed after Philip Larkin and Lord David Cecil both declared in the Times Literary Supplement that she was the most underrated novelist of the twentieth century. Their praise for her work was responsible for the publication of Quartet in Autumn and for the novels that appeared before her untimely death in 1980. She is an important writer, the heir to Jane Austen and a host of better-known novelists, both male and female, and she deserves our attention. Sadly, I almost missed becoming a Barbara Pym fan. I first encountered her in a graduate seminar on “The Comic Novel,” when my professor assigned Less than Angels (1955). My classmates joked that this course could easily have been titled “All of the Longest Novels in the Western Tradition,” and it was at times difficult to do all of the reading. I didn’t really like Less than Angels (it is still my least favorite Pym novel) and, with many other novels to read, I put it aside without finishing it. Two years later, bored on a summer’s afternoon, I picked up a discount copy of The Sweet Dove Died at a bookstore, and I’ve never looked back. I encourage you to pick up a Pym novel as soon as you can. If you don’t like your first selection, choose another. You will be very glad you did. Lovely post. I have been feeling nudged to read Barbara Pym since last summer’s wonderful NYT piece about her. Thanks for the reminder! Thank you, thank you, Roger, for keeping Bsrbara Pym alive! I adore her. Sadly, in our American public libraries, there is a crisis of literacy and taste at the highest levels . Her novels are being “discarded!” How can this be? It is like discarding Jane Austen. I’m so grateful to Roger as well! He’s on the calendar for another post in January, and I can’t wait to see what he chooses! Thank you very much for your comment.